NAMI NJ’s Expressive Arts Network Freedom from Stigma Journal celebrates recovery, wellness, hope, advocacy and the will to overcome the stigma encountered by individuals and families affected by mental illness. Its title reflects our determination to encourage all who are affected by mental illness to gain well-deserved respect, understanding and inclusion. Order a copy from NAMI NJ Store. Candy Pamerleau (left), NAMI NJ volunteer and MetLife employee, presents a MetLife Foundation Volunteer Venture Grant Award to Sylvia Axelrod (middle), NAMI NJ Executive Director and Bill Dice, then Board Treasurer and retired MetLife Officer. 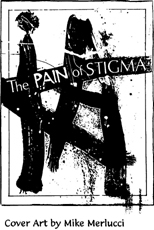 This grant has helped defray printing expenses for the Freedom from Stigma Journal. to those who have felt the destructive force of stigma.